Most of the time, we don’t think about basement windows. Basements are, after all, largely underground. However, many basements do have small, cast-in-place window units toward the top of the wall. Basement windows are an important feature if you plan to use your basement for any functional purpose, as they’re the only source of sunlight into the room. When these windows become old and damaged, they can be a pain to remove and replace. Fortunately, there are replacement windows that work for basements and ways to install them correctly, but it’s important to know that basement windows and windows on higher levels of the home are not the same, and installation may have its own challenges. What Kind of Windows Can Be Basement Replacement Windows? When in search of replacement windows for your basement, you’re looking for small, horizontal replacement windows that will be installed high along the walls. Awning windows are a popular choice, because they open outward with a hand crank. This is an easy way to let air in, and it can help you protect your home from snow during Elmhurst winters. Sliding windows are also common options. As far as window frames, vinyl, steel, and aluminium all work provided you’re going for an option secured in concrete rather than steel bucks. Basement windows made in the last 50 years can be difficult to remove. Older basement windows were often built with heavy steel frames, held in place by buck pieces and cast-in-place concrete. The steel frames will have to be cut and then pried out of the window, especially if rusted. After the frame is removed, the concrete will need to be chiseled so that everything is level, then swept, and finally sealed with masonry sealant. Only once the sealant is dry is the window ready to be installed. This is, oddly enough, the easy part and the part that’s most similar to installing replacement windows throughout the rest of the house. If you have full frame replacement windows, apply adhesive and slide the window into place. It can be tempting with basement windows to try to force the window in, but be careful not to do so, as this can cause it to break. Finally add sealant all around the window to make sure it stays in place. Because basement windows are so particular and must be done with so much precision, many homeowners feel more comfortable hiring a professional to install their replacement windows for the basement. You may feel that it’s worth the extra installation cost to make sure the installation is done correctly. 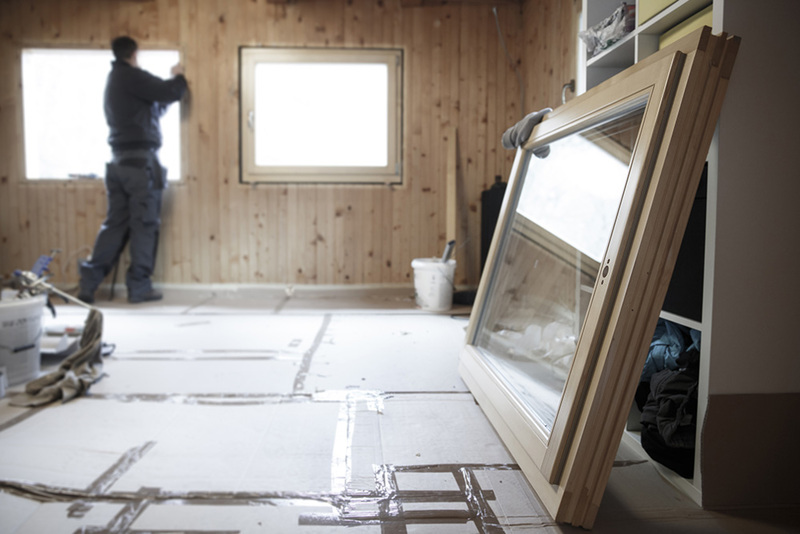 Even if you’re set on doing a DIY project, consulting a professional may equip you with the tools and resources you need to install the replacement windows well. Whether you’re looking for high quality replacement windows from brands like Sunrise or Weathershield, an expert replacement window installation, or help for your DIY installation in Elmhurst, The Door Store has you covered. Contact us today and tell us about your basement replacement window project.